The history of this expansive network of huts goes back to post world war 2 when the government placed the job of bringing the virus like spread of introduced Red and fallow deer into the hands of the newly formed NZ Forest Service. The NZFS commenced a campaign to build huts to house the multitude of cullers employed to live in the bush and hunt the vermin decimating the native flora. Hikers (commonly called trampers) and climbers were the first recreational groups to take advantage of these facilities when the NZFS was disbanded and the Department of Conservation inherited the huts and shelters. Many got visited so seldomly they soon got struck off the meagre budget DoC was allocated for maintenance and were dismantled or left to rot. Others became someone's or a communities pet project and were well looked after and more recently some were given historical relevance and were restored to their original condition. They come in all shapes and sizes from tiny little 2 bunk sheds which are referred to as 'bivys' to the palatial like lodges on the great walks with beds for 40-50, gas cookers and flush toilets. My favourites are the 6 bunkers truly NZFS era, foam mattresses a stainless bench and most with a wood stove. On the trip in question to one of my most local huts, which involves a 4-5 hour technical ride to reach. I had ventured up there after one of the wildest winters in recent years, high winds and several snow falls and dumped a heap of foliage on the trail and being an out and back it was in my best interest to clear as much as I could by hand. This had slowed my progress considerably and the day was wearing thin when I reached the top junction with another half hour to go (normally). The last 100 vertical metres became increasingly snow covered until the last pitch had maybe a foot of snow under the stunted sub alpine beech canopy. It was quite treacherous as it was quite icy, I did contemplate ditching my bike with impending darkness drawing near. It certainly was a relief to round the last bend and see Black Hill hut. This is often the case on epic missions, the sense of elation at the first sight of the hut like the finish line of a race. On arrival the proceedings begin, gathering firewood, lighting the fire, warm clothes on, hot water on for a meal and checking out the hut log book entries. On this trip the last visit was 16 days ago. I always feel very fortunate to have one of these havens to shelter the night in and during this night a NW wind rose and shock the hut while I snuggled further into my sleeping bag secure in the knowledge that the hut built in 1960 had withstood many storms. 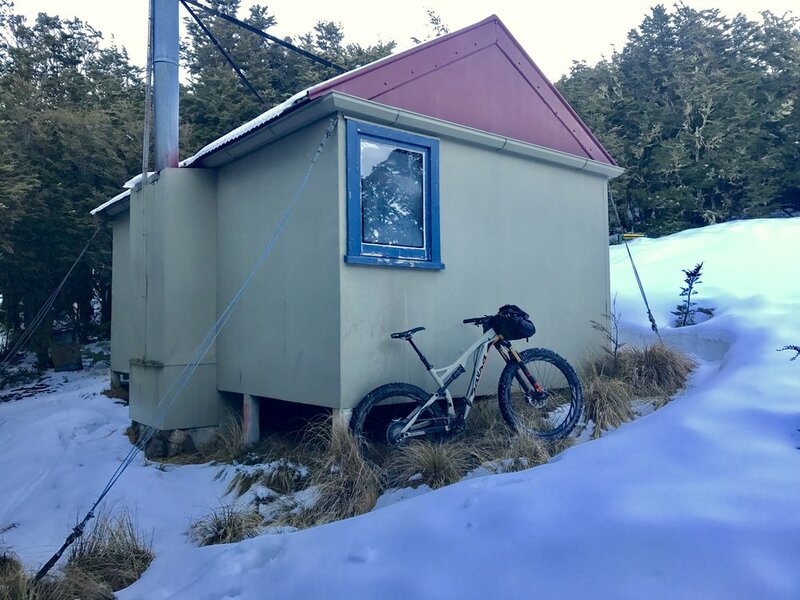 It is a privilege to visit these huts with often no more than a sleeping bag and some provisions and an important part of the kiwi backcountry culture. Get out there and bag some huts.